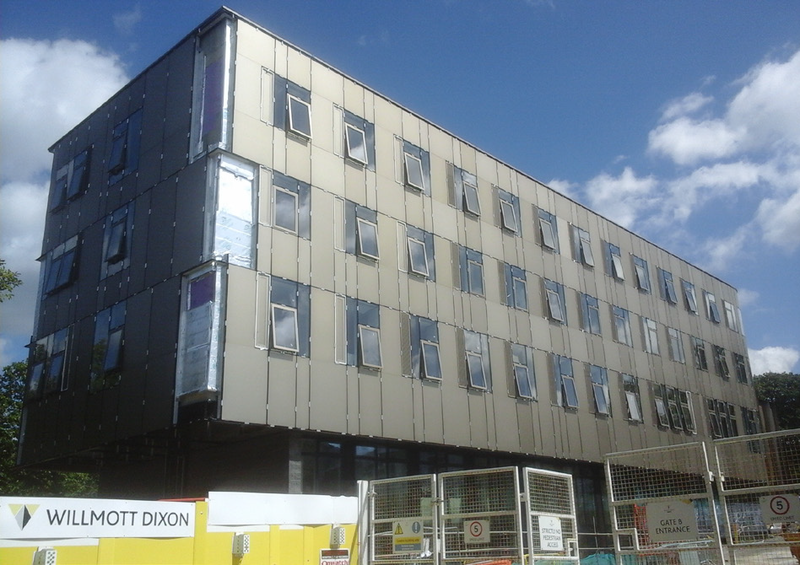 The construction of the new academic building for Kent Business School (KBS) and the School of Mathematics, Statistics & Actuarial Science (SMSAS) at the Canterbury campus is progressing well. Externally, the installation of the glazed curtain walling system has continued and works on the main roof have also progressed with the installation of organic plant panels and solar panels across the roof. Internally, all walls have now been erected and flooring installation is complete with ceilings across all wings soon to be finished. Carpentry works have further progressed with the installation of skirting boards. The fitting of mechanical and electrical items including radiators and sockets/switches is ongoing and the light fixing has begun on the upper floors. The tiered seating to the small lecture theatre is now also complete. The building is planned to be finished in February 2017. Designed as a vibrant new campus destination the building will bring together academics, students, researchers and administrative staff from KBS and SMSAS, giving students the opportunity to learn in a more modern and dynamic facility.